Day three of the Heritage Trip to Poland began with a short bus ride to visit four synagogues in the Kazimierz section of Krakow. Each synagogue differed in its founder and style. The first was the Rema’s shul, which is located right near his grave, which we also visited. The next shul, the Isaac Synagogue, was founded and sponsored by wealthy philanthropist Rabbi Isaac. After that we saw a completely different shul which is formalized known as the Kupa Synagogue but is nicknamed “Poor Man’s Synagogue.” This shul was not sponsored by a wealthy figure, rather the entire community collected money for it. All three shuls were built in the 1600s. The last shul, built in 1821, was called The Temple Synagogue and was very left wing compared to the others, and was thus controversial in its time. 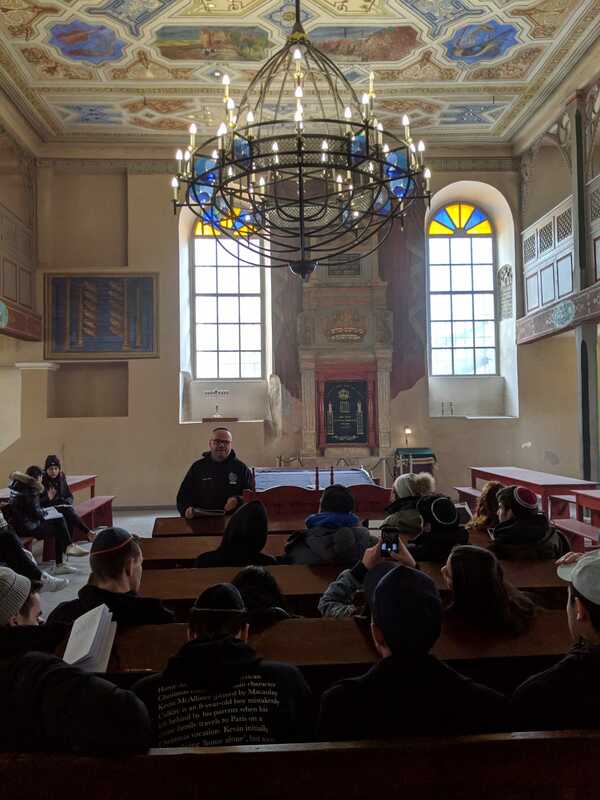 When we arrived there were already two other tour groups inside, and when one of them started singing and dancing near the bima, some of our students immediately joined in. Soon all three groups were singing and dancing together, a joyous moment that was a needed respite from the somber nature of many of the other destinations on this trip. The next location we visited was the Plac Zgody, the big square where Jews were rounded up before being sent into the Krakow Ghetto. 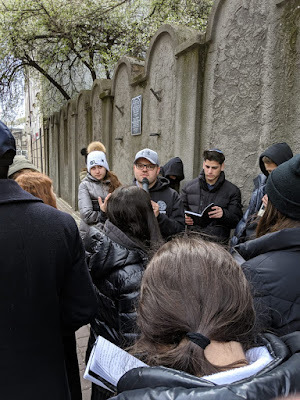 A few blocks away we stopped at a remaining piece of the actual wall of the ghetto and learned about the history of the Jews who lived there. This place was where many of the scenes in Schindler's List, the movie we watched yesterday on the bus, took place. Our next (and highly anticipated) stop was Auschwitz II, also known as Birkenau. Upon our entrance, we all noticed the long train tracks that extended throughout the entire field. 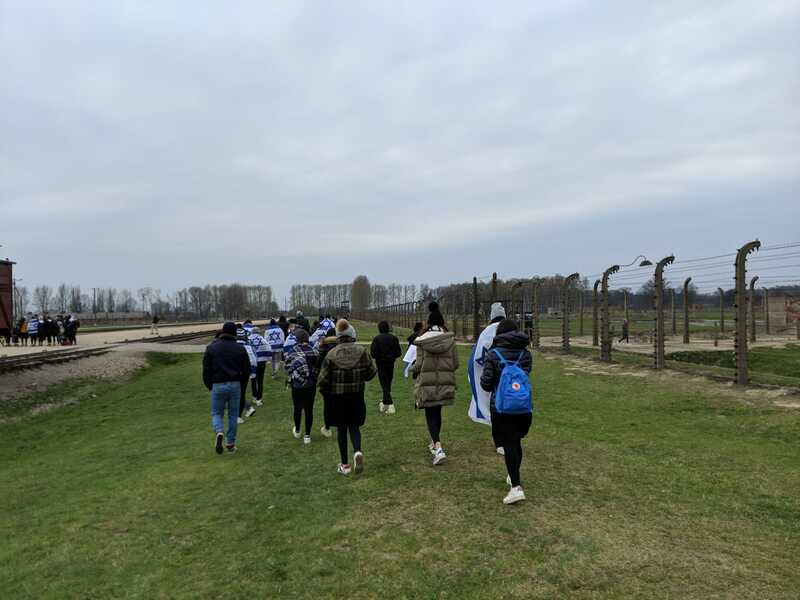 We later learned that as a result of these train tracks, Jews from all over Europe were sent to this camp. 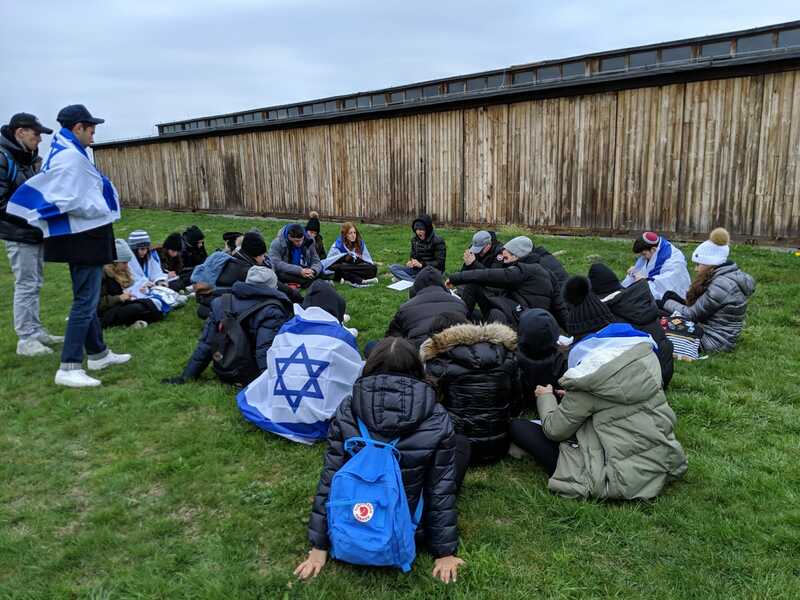 We learned about the process that arriving Jews went through. We visited the Quarantine Barrack, which was used to isolate Jews to ensure disease wouldn’t spread. 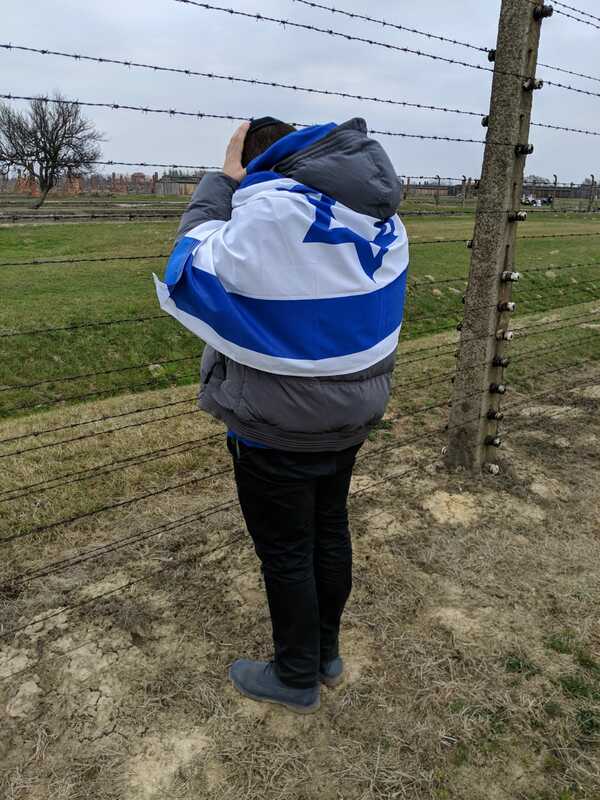 Next we stopped alongside the section of the camp where Hungarian Jews were imprisoned. It was especially emotional for a few of us, as two students and one teacher had family members who were imprisoned there. Next we walked further into the camp to the remains of one of its gas chambers and crematoria, and read poems and first-hand accounts about the horrifying actions that were performed in there. After that we saw the Sauna, a building where arriving Jews were stripped of their clothing, had their heads shaved, had their belongings taken, and were tattooed with numbers. All these sites showed the dehumanization that occurred as the Nazis stripped the Jews of every aspect of their humanity. 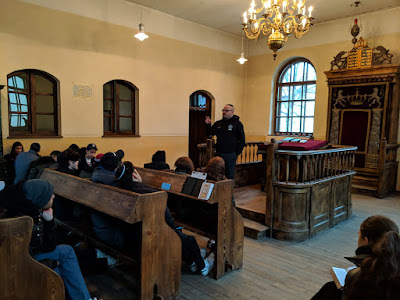 Lastly, after leaving Birkenau, we went to our fifth shul of the day, Auschwitz Jewish Center, to sing, pray mincha, and engage in some group learning about the actions of a variety of individuals in the Holocaust and the choices they all made in their various roles.